Super League club Salford City Reds are the subject of a winding-up petition, BBC Radio Manchester has learned. It has been presented by club sponsors and management consultants, Steuer Gregsson Limited, and will be heard in Manchester on 29 October. The Reds have appealed throughout the season for fresh investment, following their move to the Salford City Stadium at the start of the year. Salford have said the matter is "over a small amount of money". On their Facebook page, they commented: "It is being dealt with. The club have brought people in to sort it out and it will be." An outstanding five-figure tax bill, owed to Revenue & Customs, was paid in April. Earlier in the month, they had with the Sharks playing their first competitive fixture there in August. 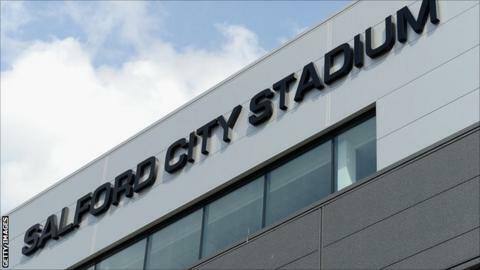 Before moving from their former home at the Willows to their new £26m stadium in Barton at the start of the season, the Reds had stated that they needed to average around 8,000 fans for every home match at the Salford City Stadium. In his final programme notes of the season, following the fixture mix-up, Reds chairman John Wilkinson said everyone at the club would begin a "relentless" pursuit of success. "It is vitally important to the club and the city that it's only standard bearer has a solid base in Salford," he said in September. "We cannot become nomads, as this has fatally wounded other once great rugby league clubs. "It will not happen to Salford City Reds, not on my watch. "It is fair to say that this whole season has been something of a trial for staff, players and board alike. "My promise is that we will be better, we will work smarter and we will bring reward and satisfaction to you all [the fans]. That process begins now. Not tomorrow, not next week - right now - and it will be relentless. "Actions will speak louder than words here, and is our intent that our actions will grow to become deafening over the next few months and years."